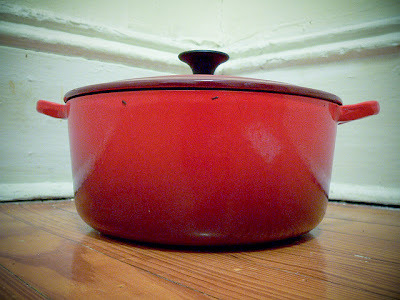 If you want to do any amount of braising or roasting on (or in) an oven, you really need a decent Dutch oven. Its use isn't just limited to the kitchen either. A Dutch oven is a great multi-purpose cooking vessel that can extend far beyond the confines of any kitchen. A Dutch oven is a thick-walled (the best are cast iron) cooking pot with a tight-fitting lid. Dutch ovens have been used as cooking vessels for hundreds, if not thousands, of years in one form or another. Sometimes they are also referred to as casserole dishes. Dutch ovens have similar variations throughout many parts of the world. European and North American versions are often enameled over the cast iron core. Dutch ovens are at their best when you need slow, long cooking for braising or making stews. Because of their thick walls they also give a very even heat. I find mine useful any time I am making anything in quantity, be it long cooking or not. 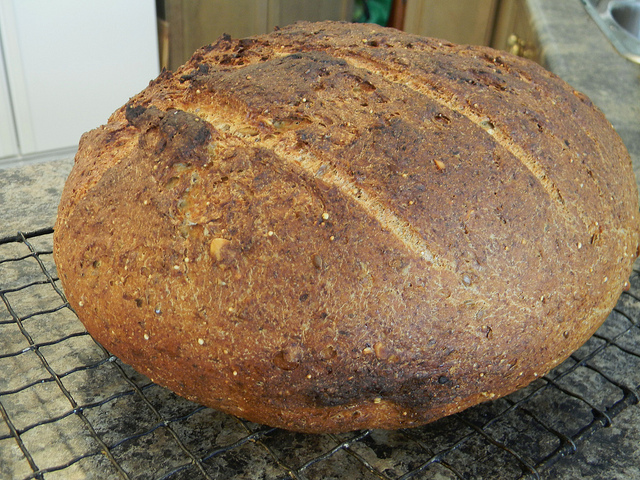 A sourdough boule cooked in a Dutch oven. 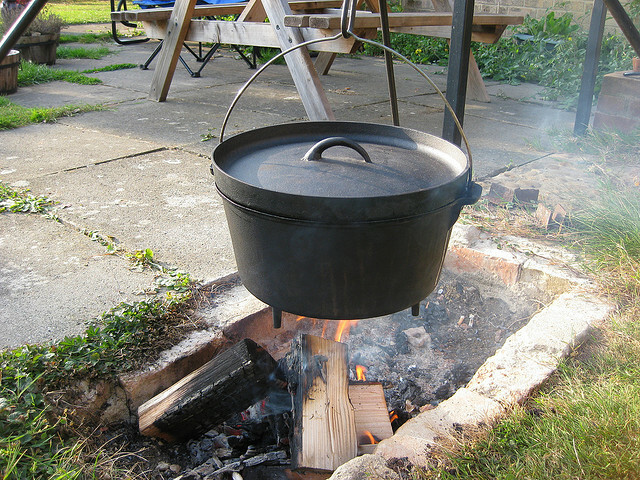 Because cast iron Dutch ovens can be used directly on an open fire they were the pot of choice for Western pioneers as they made their way across North America in the 1700 and 1800s. A truly multi purpose pot, they were used not only for cooking the main meal but also for breads, cakes, biscuits and more. At times the pots were stacked to utilize the heat arising from the bottom nest of coals. Dutch ovens come in various sizes. They are measured by the diameter of the top opening. 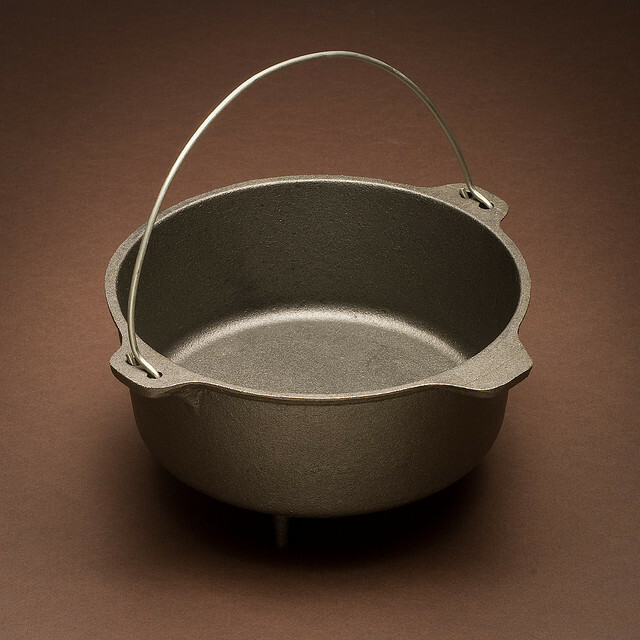 The most popular Dutch oven is the 12" version which holds about 24 cups and can serve about 12 people. Smaller sizes are more convenient for making smaller dishes, but if you purchase only one buy a larger size. You won't regret it. You need to season new cast iron to get the most benefit from it. 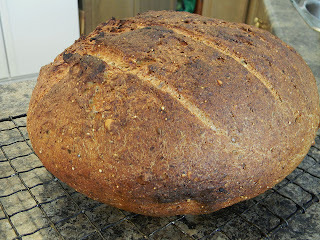 It is "possible" to season it as you use it, but that is a long process that yields very poor results. Take the time to do it right from the start. The method below works on any kind of cast iron cooking utensil. Rub the vessel with a very thin coat of unflavoured vegetable oil (canola, sunflower, etc., not olive for example). Rub off any excess with paper towel or a cloth. It may look quite dry, but oil is left behind. Place the pan upside down in an oven with a sheet of aluminum foil underneath to catch any drips. Heat the pan for 30 minutes in a 450° to 500°F. oven. The heating seals the droplets of oil into the surface of the pan. This also helps create a somewhat non-stick surface. After the 30 minutes, turn off the heat and let the pan cool down while still inside the oven. As it is seasoned the surface will turn from grey to nearly black. Over time, with use, it will turn very dark. To get a good starting bond you should repeat the process at least 3 times. Now your cast iron is all ready to go! 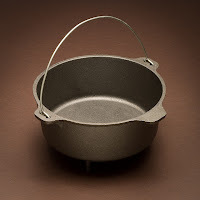 A well cared for cast iron pot of ANY kind will last for decades and decades. There are examples of pots that are still in use after hundreds of years. It seems like an investment worth the money. Cheaper ones are available. 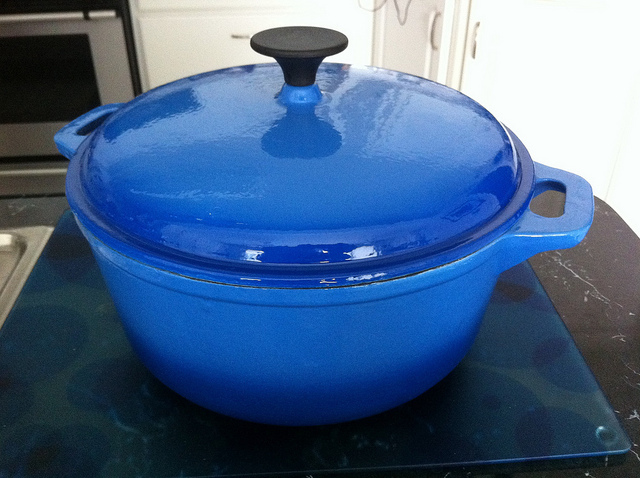 My black Dutch oven (not Le Creuset) cost about $60.